Diamond Comic Distributors has released its lists of Top Comics and Top Trade Paperbacks and graphic novels for 2011, and as I did the last two years I have combined that information with my own estimates of aggregated sales of comics and trades throughout the year and other information to project longer lists, with estimates: the Top Thousand Comics and the Top Thousand Graphic Novels for 2011. Again, it’s a fairly large page given the number of items, but I am reluctant to fission off trades to a separate page. I have rounded each entry to the nearest hundred copies, as before. The Top Thousand Comics account for at least 47 million copies, or well over half of all the comics that Diamond sold. Last year, the Top 1000 amounted to 45.3 million copies. In full retail dollars, they sold for $161.3 million, slightly more than last year’s $160 million. The Top Thousand Trades went for $58.4 million, a drop from last year’s $64 million. That’s consistent with what we know about the year in general: comics up, trades down. Combined, these two lists alone account for around half the orders by dollars Diamond received in publishing last year. 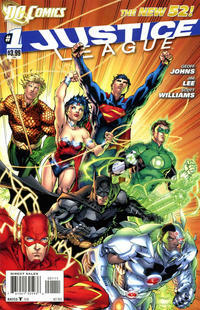 Justice League #1 was the top seller for the year, with more than 230,000 copies sold to North American retailers across several printings. Note that Diamond did not combine the Combo Pack orders with the main entry, as they were differently priced; estimates for the Combo Pack for #1 brings the total number of copies of the issue in the Direct Market closer to 255,000 copies. Yes, this figure differs from one that was recently mentioned in a recent interview with DC, which put the number of copies shipped at just over 361,000. I believe that calculation must include European sales of the U.S. version through Diamond UK, which would be at least 10% again what the North American Numbers were; it also likely includes the number of copies shipped to the newsstand. That’s a slight drop for Marvel and an increase of 28 entries for DC. Not a lot of change there: DC lost a few entries and Marvel added a few. Assorted others accounted for the rest. I have split up the Top Comics of the Century up into two different pages: one for the Top Comics for the Decade of the 2000s and one for Top Comics From 2000 Forward. The 2010 and 2011 entries have been incorporated into the latter — and we find that 24 comics from 2011 made the Top 300 for the century. That’s an improvement over 2010, in which only nine issues would have made the list, and none higher than 51st place. Justice League #1 places 13th for the century — and note that on this one chart I did include known Combo Pack sales for all the issues that had them. The average price of comics in Diamond's Top 1,000 comics for 2010 was $3.37; the median price was $2.99. Last year, the mean for the Top 500 was $3.52, with a median price of $3.99. In 2009, the mean for the Top 500 was $3.42, with a median price of $2.99. There are 20 other years of Diamond annual reports on the site, going back to 1991. That does it for 2011. On to 2012!